In July, the streets of Kyoto are lit by lanterns and thronged with locals and visitors, dressed in colourful yukata, or summer kimonos. Onlookers admire the floats, eat yakitori and dance. They are there for the Gion Matsuri – one of Japan’s largest festivals – which was founded in the ninth century to ward off plague. Gion is just one of around 300,000 matsuri, great and small, that are celebrated each year across the country. Most have their origins in religious ceremonies and are still closely associated with local shrines. Traditionally many were linked to the changing of seasons: farmers prayed for a successful rice harvest at spring festivals, and gave thanks to the gods in the autumn. Today, they are closer to a street party, though the highlight of many matsuri is still the appearance of the mikoshi, a portable shrine that is taken out of storage for the occasion and paraded through the streets. Some take surprising forms: on the first Sunday in April in Kawasaki near Tokyo, the Kanamara Matsuri – the festival of the steel phallus – takes place at the Kanayama Shrine, where mikoshi shaped like giant penises are feted. It’s not as bizarre as it might seem. The shrine has long been visited by people seeking help with fertility and sexual health. Today the festival has been adopted by the LGTBQ community and draws visitors from around the world. Every evening for two chilly weeks, young monks hold aloft large pine torches and run back and forth on the temple’s balcony. On the last day, around a dozen torches are lit at once and hung from the balcony, showering flames and sparks on the onlookers below. It may seem dramatic to the point of incendiary, but the belief is that bathing in these sparks will protect you from evil and misfortune for the coming year. 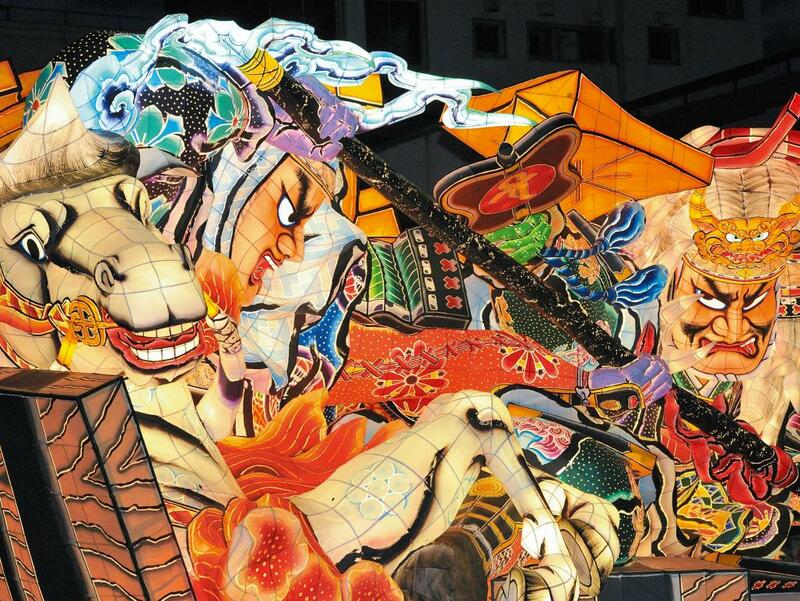 For a few warm evenings in August, the northern prefecture of Aomori becomes a stage for mythical figures that return to the Land of the Rising Sun as massive lantern floats (above). Crafted and painted on washi paper by artisans, and pushed by locals, these vividly lit figures weave back and forth through the streets of Aomori City. The floats are escorted by hundreds of haneto dancers – which literally means “those that jump” – who bounce and chant to the powerful rhythm of cymbals and taiko drums. Visitors can join in, as long as they wear the traditional haneto costumes, available for rent or to buy at local shops. This festival celebrates soup. At the Tokyo Ramen Show, stalls fill the Komazawa Olympic Park, serving local specialities from the savoury miso ramen of Hokkaido in northern Japan to the creamy tonkotsu soup of Fukuoka in the south. Original dishes, designed specifically for the event by the rising chefs of the ramen world, are available for adventurous slurpers (think noodles in sea-urchin-infused broth, or bowls full of crab innards). There is even a halal option for those who prefer to stay away from the standard rich, pork broth. A relatively new festival, it now pulls in more than 3m noodle aficionados each year. Live music and dance performances add a dash of traditional matsuri flavour to a ramen feast.